Carol Kent and her husband, Gene, are now living what some would call a heartbreaking life -- their son, Jason, a young man who initially had so much promise, is now living out a life sentence for murder in a maximum security prison. All their appeals have been exhausted at both the state and federal levels -- humanly speaking, they have run out of options. But despite their hopeless situation, Carol and her husband live a life full of grace. Kent reveals how life's problems become fruitful affliction where we discover the very best divine surprises, including peace, compassion, freedom, and adventure. 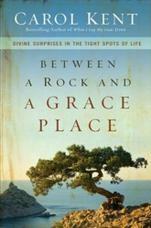 Through the Kent's remarkable ongoing journey, Jason's riveting letters from behind bars, and true "grace place" stories from the lives of others, Between a Rock and a Grace Place reveals that when seemingly insurmountable challenges crash into our lives, we can be transformed as we discover God at work in ways we never imagined. With vulnerable openness, irrepressible hope, restored by joy, and a sense of humor, Carol Kent helps readers to find God's "grace places" in the middle of their worst moments.